Paneer Bhurji is a simple and very tasty side dish. In a kadai/wok, heat oil add onion, garlic and saute till transperant. Add tomato and cook till its soft. Then add capsicum and saute for 5mins. Add garam masala, turmeric, red chilli powder, salt and mix well. Finally add grated or scrambled paneer. I scrumbled it. Paneer Bhurji is ready. This can be a perfect combination for chapathi/roti/naan. Sometimes I even stuff on sandwich too. This can also be great sidedish for picnic or lunch box if you plan to carry chapathi. Paneer Bhurji is going off to Letz Relish Paneer by Jay. Yummy and delicious recipe.. looks simply awesome !! Looks great. Simple and yumm! Just love paneer as anything, very tempting bhurji..
Never tried this famous dish so far,sounds good! paneer bhurji looks awesomely yum ! i too luv this on bread toast/sandwhich..yum ! never tried dis recipes...gud one! Luv Paneer Burji,Yours looks perfect and delicious!! 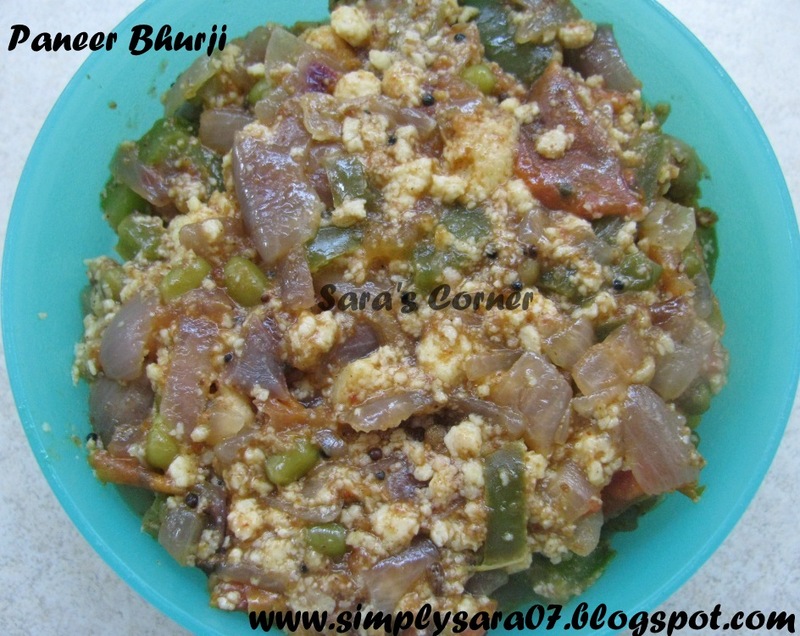 Scrambled paneer bhurjee makes me crave. very nice one dear. Paneer bhurji sounds healthy and incredibly delicious...nice presentation...love this recipe...!